The calibration laboratories at Biospherical Instruments are designed to calibrate systems before deploying to customers, recalibrate returned instruments, and to validate the design goals of new instrumentation and measurement technology. Mounting fixture for Standard of Spectral Irradiance. The red lines are traces of the laboratory's laser alignment system.The BSI calibration laboratory was validated by several calibration intercomparisons sponsored by NASA prior to the start of the OSPREy project (e.g., Meister et al. 2003). The facility was further improved in 2009 to meet the requirements for high-accuracy calibration transfers covering the wavelength range of 280–1,700 nm. The design of the upgraded facility is based on recommendations established by NIST (Walker et al. 1987 and Yoon et al. 2010). Materials (e.g., paints, divider walls, and baffles) with low IR reflection were selected to reduce uncertainties from stray light at wavelengths beyond 1,000 nm. The entire laboratory is temperature stabilized to ±1°C. The calibration laboratory has several optical benches: two are used for Irradiance Calibrations (with one set aside for lamp transfers), one for Radiance Calibrations, one for in-air directional testing of irradiance and radiance collection optics, and one for directional testing of radiometers fully immersed in filtered water. There is also a vertical irradiance bench used to determine immersion coefficients (the change in optical collection efficiency when a radiometer is used immersed in water). The primary standards used are FEL Standards of Spectral Irradiance issued by NIST. BSI maintains a library of these standards and draws on that library to generate working standards. 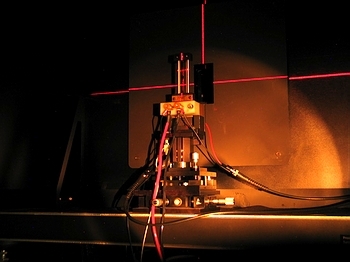 Finally, reference radiometers with hybrid optics composed of arrays of microradiometers at different wavelengths plus a spectrograph, are maintained and used for frequent checks of the standard lamps. The calibration laboratory also maintains calibrated voltmeters, shunts, temperature, and pressure reference devices. Calibration facilities are available to third parties on a contract basis. Meister, G., et al. (2003). Comparison of spectral radiance calibrations at oceanographic and atmospheric research laboratories, Metrologia, 40(1), S93–S96. Walker, J.H., R.D. Saunders, J.K. Jackson, and D.A. McSparron. (1987). Spectral Irradiance Calibrations, NBS Special Publication 250-20, National Institute of Standards and Technology, Gaithersburg, Maryland, 90 pp. Yoon, H.W., and C.E. Gibson. (2011). Spectral Irradiance Calibrations, NIST Special Publication 250-89, National Institute of Standards and Technology, Gaithersburg, Maryland, 25 pp.